Now you can find us on Facebook! Like us and keep up to date on any upcoming shows and new pieces! When I was very young and lived in Holland, my parents put me in a big wooden shoe and pushed me out to sea, only to land in Canada. I grew up and took various jobs but had great interest in Taxidermy which I pursued for 30 years. I also enjoyed wood working and after being in taxidermy for that many years I decided to pursue the antique business - only to carry the nickname 'Stuffer' with me. I therefore call my business Stuffer's Antiques. 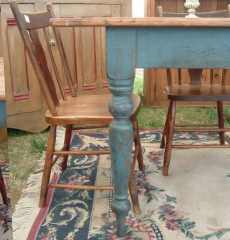 I started out buying and selling antiques and later realized that true country antiques were getting harder and harder to find, so I decided to build harvest tables (aka: country tables or farm tables) and benches. I started building tables when I saw that customers were in need of different sizes at an economical price. I have, since then, expanded to coffee tables and benches. 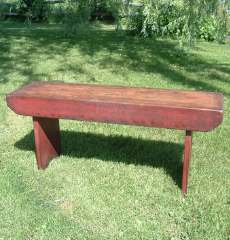 At the present time, our tables are being sold from Ontario, Canada all the way to Florida. Oh and by the way, I lied about the wooden shoe. Ha! Although I do wear them!